There are some days when the children are extremely well behaved and lovely to teach but today was not one of them. Maybe it was the food they had eaten (too much colouring and additives!) or they were just restless. The noise was steadily climbing higher. I was doing groupwork with some children while the rest should have been doing quiet work. I couldn't hear myself talk. "Quiet!" I yelled but it was not enough to rise above the din. If I had my whistle I would have blew it. "Quiet!" I yelled even louder several times and "Stop!" a few times more until the class eventually quietened. "That was too noisy!" I exlaimed. My ears ached from their noise and I noticed that I was talking too loudly. I didn't like the way this was going. I didn't want this to be the standard noise level. I had to bring it back down. I had to do something drastic. "If you need to talk then please whisper," I whispered, loud enough to be heard. I could see that the children were paying attention. "Go back to what you were doing but please whisper." It was amazing. The noise stayed at a quiet hum. Every time I had to say something, I would whisper and the children would have to pay attention to hear me. At one time, when I had to reprimand a child, I just said, "No snatching! Share nicely." It came out as if it was a shout that it made the children jumped. They had became used to the low noise level that anything louder than normal speaking voice was like a shout. 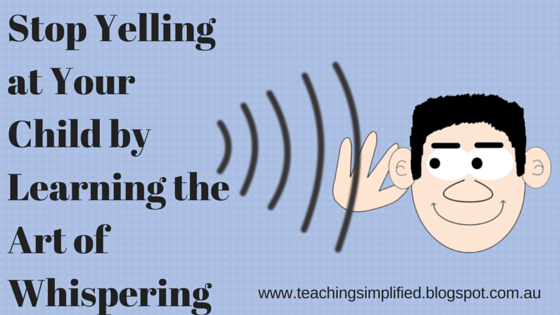 Teachers and parents, you train your children to be accustomed to a certain noise level. If you shout all the time then this becomes the norm. But if you lower your voice and talk quietly then children will accept this as normal. So if you find yourself shouting too much you'd need to reduce the volume of your voice. When you do this your children will reduce their own volume to be able to hear you. When you whisper you model what's appropriate. Likewise, when you shout all the time at your children, you are modelling that it's ok to shout all the time. If you find that your children are shouting too loudly then try lowering your voice. They will have to lower their voice as well otherwise it will seem very strange for them to be shouting. Remember to provide positive feedback when your children are using the correct volume for talking. When you do this your children will know that they are doing the right thing. The art of whispering requires you to lower your voice, model the correct volume and provide positive feedback. Try it today. What are some things that you do to not yell at your children? I always find it really difficult to control the noise level when there are too many people in the room, let aside children! Thank you, that was a great and useful advise! What if parents already talk loudly from time to time since they were kids.bcoz of course the parents weren't learn about this..and when the time they are already teen,they think that is the standard noise they used to knoww, what should the parents do? It's not too late to change the volume of how you speak in your household. Lower it now and your teenagers will have to strain their ears to hear you. One thing to remember is to not shout to them from across the room, or worse, from another room. Go up to them and make sure you have their eye contact and speak quietly.